Liquid Learning is delighted to present the 2nd Annual National Higher Education Faculty Marketing Innovation Conference 2013 – the premier information, professional development and networking platform to debate and prepare for the unique challenges of Faculty Marketing in the Higher Education sector. A balance of local and international case studies combined with expert presentations will allow delegates to develop and implement marketing strategies that succeed in the unique and evolving operating environment of the Higher Education faculties. 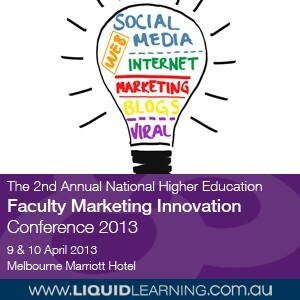 Follow this event on Twitter using the event hash tag #FMI13 and @LiquidLearning for daily industry updates! Higher Education institutions are facing increased competition both domestically and internationally. Prospective students have an ever increasing suite of options at their disposal and it is increasingly important for Universities to distinguish themselves from their competitors. In the global environment in which academic institutions now operate, it is essential to leverage communities and digital channels to reach a global audience in a cost effective and timely manner. Within this context, the crucial role of marketing at the level of faculties and schools is often overlooked and underestimated. These case studies will be supported by expert commentaries, adding to the understanding of delegates to ensure that their messages cut through the clutter and are effectively reaching their target audience in an increasingly crowded market.